Tagline The new fragrance for men. TOP - Mint gives its explosive flavour to a surprising and unusual top note. Spearmint, peppermint and wild mint create an unexpected bouquet, its incredible freshness providing a stunning effect. HEART - The heart of the fragrance reveals the seductive power of Code Sport, introduced by citrus fruits. Like a crisp coating of ice, hibernal underlines these contrasts and prolongs the dialogue between icy crispness and sensual breath, giving the fragrance an almost unlimited life. BASE - The woody and distinguished character of vetiver from Haiti is both wet and dry, with fresh and hot nuances. This ambivalence creates a particular sensuality and vibrancy, very attractive on men's skin. Communicating self-confidence and charm, vetiver provides a very intimate comfort. Ginger from Nigeria illuminates the base note and brings a crackling and woody vibrancy. Hard to believe, but there was a time when the big-screen bombshell and face of Armani sported streaky orange hair and braces. "I love the orange blossom in this men's scent. My husband [Brian Austin Green] wears it, and sometimes I do too." 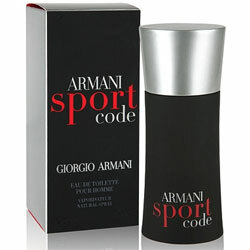 Armani Code Sport by Giorgio Armani eau de toilette, $59/1.7 oz. ; giorgioarmanibeauty-usa.com.